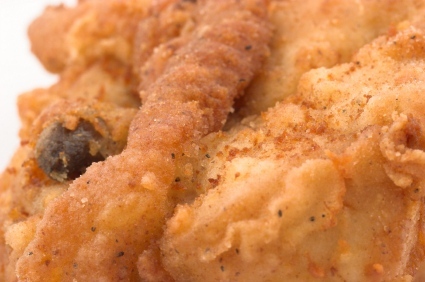 I have more than just my best fried chicken recipe, check out more easy chicken recipes at the end of the page. My fried chicken is juicy and tender; your family will love it. The seasoning is perfect and can be made as spicy as you want. MSG is a important ingredient to this recipe. It is a natural amino acid found in vegetables. ACCENT flavor enhancer is what I purchase to make this chicken. It's found in the spice aisle at the supermarket. Soak the chicken pieces in about 4 cups of water after dissolving the salt and Accent. Turn and marinate for 20 minutes. Whisk the egg and milk in a bowl. Sift the dry ingredients together and place in another bowl. Meanwhile, after the chicken is done marinating, bring it out of the bowl and let dry on paper towels completely. DO NOT RINSE. Coat one piece of chicken in the dry ingredients and then dip it in the egg mixture, and then dip again in the flour mixture. Coat generously and place on a cookie sheet. Repeat with the remaining chicken pieces. Carefully place 4 pieces of chicken in the hot vegetable shortening and fry for 12-15 minutes; or until each piece is entirely a light golden brown. Drain before eating. Delish.